Painting tips: how to paint wood? Below are practical painting tips that help you to obtain the best long term results. 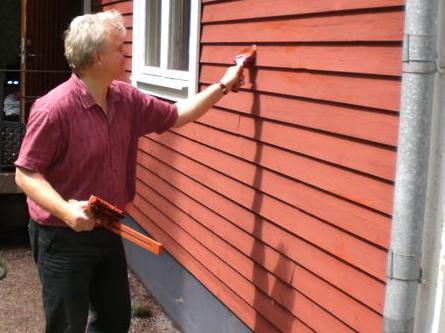 With Moose Färg exterior painting is easy, pleasant and fast and provides lasting results for many years. 1) Study the surface well, first remove the loose paint parts by sanding well or use a hot fan or paint remover, you also need to degrease the surface of the wood with Moose Linsåpa, environmentally friendly linseed oil soap. This removes grease and dirt from the surface and it ensures good adhesion of your Moose Färg wood paint. 2) If the old paint is removed, you can see the surface sand well. A rough sanded surface gives a better result and is tight in the paint timber. Do you want to prevent mold and rot request more information. The use of antifungal agents is always harmful to the environment, so if you do not need it it is always best. If you’re here to opt in difficult situations exists fungus common impregnation may help to treat the wood for befor painting; If you already have mold I have therefore a special spray to remove the mold. Seek advice. Note: If wood is very fresh or impregnated juices come out of the wood. This reduces the adhesion, therefore it is better to let fresh wood first thoroughly dry (this may take several weeks, sometimes a month). This is particularly the case with impregnated wood. With a moisture measurement tool professionals can determine the moisture content in the wood, we advise 17.5% which is generally the case for air dried wood that has been outside for 2 – 3 months. 3) The base layer brings you Moose Färg first one time, it’s his own primer. 4) Once the base coat has dried, you can apply the finishing layer. You should therefore at least two layers brengen.Tussen to the layers you should not abrade the surface. Minimum temperature around 13 degrees, otherwise the paint dries too slowly. Moose F is ideal for planed wood as we use much in the UK but can be used for already painted wood. Moose F and RDM have extra adhesion that makes them suitable for already impregnated wood or painted stained survfaces. However good pretreatment is the key. The underlying paint should not be capable of blistering and should not have any gloss. We disrecommend painting over thickly painted acrylic substrates. The frequently heard rumor that waterborne paint is applied over solvent-based paint is not correct. It depends greatly on the paints if they are compatible and most are. Moose RDM is perfect foor window frames, doors and weather boards (bargeboards) as it contains more pigment and oil. F type in most good cases your choice use provided pretreatment is well done (rough sanding the primer, good cleaning for example Moose Linsåpa linseed oil soap. As said: leave the 1st layer to dry well before you apply the second. I LOVE your paint! It has transformed my humdrum little garden office into a style palace! I will definitely spread the word. Here’s a pic of the finished result. Many thanks for a great product (and a great paintbrush).